Personalized Mission Style House Number Sign - - custom made one-line address plaque. Big 3.5" numbers. Made in USA. 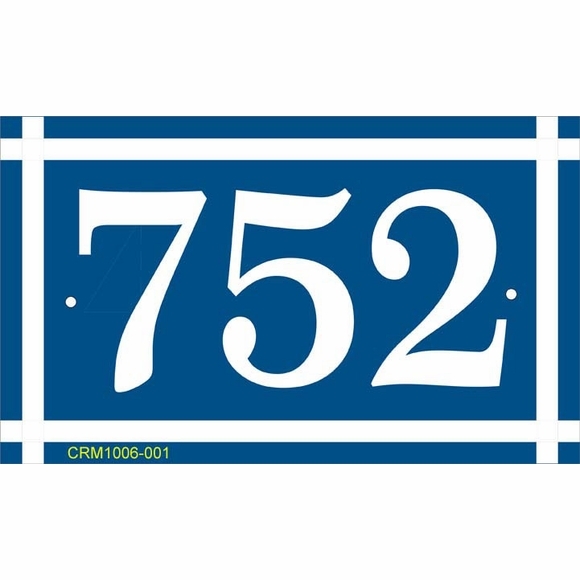 Customized with your choice of size, color, and house numbers you specify. Mission style, similar to Craftsman style and Arts and Crafts style, is characterized by home accessories that are simple, functional, and decorative. 10"W x 6"H sign holds a three number address. 15"W x 6"H sign holds a five number address. Can also hold a name instead of numbers. Your choice. The style numbers shown in the samples are not printed on your sign. Characters and mission border are permanently engraved into the sign during the production process. Mission border is the same color as the personalization and accentuates the rectangle shape. Comes with 3/16" diameter fastener holes and stainless steel mounting screws. Small 10"W x 6"H has two fastener holes while the 15"W x 6"H sign has four holes.